According to a new study by the Student Loan Report, student loans continue to be the leading form of debt in the United States. More than 44 million borrowers now owe a combined $1.4 trillion in unpaid loans, creating burdens for graduates after college that can impact the ability to buy a home, start a family or make other significant financial commitments. Despite widespread debate, debt continues to grow, even though many remedies have been proposed or attempted, including holding the line on tuition costs, student loan refinancing and general and wide sweeping student loan reform. 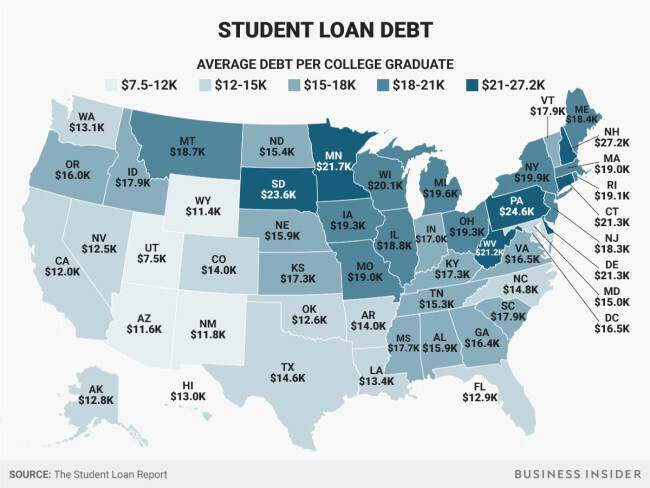 One of the most interesting aspects of the study revealed that the amount of debt a graduate carries varies widely from state to state. Utah students graduated with the least amount of debt ($7,545) while New Hampshire students graduated with the most debt on average ($27,167). Based on the 1,100 colleges and universities surveyed, the national average loan debt per graduate for the Class of 2016 was $17,126. In addition, across the United States, 61.22% of students graduated with student loan debt. College graduates in the Northeast tended to have more debt on average, and those in the Southwest had the least on average. Families in the Northeast spend about 70% more on college than those in the West, Midwest and the South. A typical family in the Northeast spends about $35,431 for college annually, which is twice the average amount of what families in the West spend, which is $19,181. Higher price tags in the Northeast are probably due to student enrollment at four-year private schools, which is the highest in the nation for students in that part of the country. About 40% of students in the Northeast select a private college, compared to 22% in the Midwest, 19% in the South and 14% in the West. Public school students from the Class of 2016 left school with $16,066 in student debt on average and private school graduates left school with $19,257.